The garden has been designed to provide a peaceful space to relax or dine in. We love to eat outside but English weather can be unpredictable so we built a garden room to give some shelter from wind and rain and in the heat of the day some shade from the sun. You will find a table and 8 chairs in the garden room and a coffee table and 4 armchairs on the deck. Please leave the painted chairs undercover because they are not weatherproof. Please explore the garden but the gravel beds and dry riverbed stones are not designed as a play area or for for foot traffic and will move underfoot also the gravel is planted and care should be taken to avoid damaging these and any seedlings coming through. We have built the pizza oven next to the dining area to give guests the opportunity of cooking in a wood fired oven and to benefit from the radiant heat as the night cools. But be prepared this is a long process to get the oven and dough ready but a wonderful way to prepare a meal with family and friends. To use the oven we suggest lighting a small fire about 2 hours before you would like to cook, then the dough can be made and left to prove. The fire should be tended regularly but not built up too much because this will just burn a lot of wood without heating the bricks any quicker. 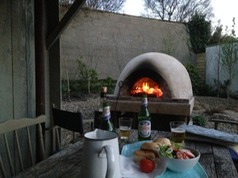 We have provided tools to move the ash and logs around and a peel to load the pizza into and out of the oven. The oven is at the right temperature for cooking pizza when the soot inside the oven is burned off leaving clean bricks to the edge of the brick arch. It will be about 400 deg C and at this stage and pizzas will cook an a little over a minute. Please be very careful that no burning wood or hot ash falls out of the fire as it could burn the deck or set fire to the woodpile. Please only burn untreated dry hardwood to keep the smoke nuisance to a minimum. We have a page on our website with more information and photographs to help should you want. We have left a small quantity of wood for your use and more is available to purchase locally. The garden has an automatic drip irrigation system installed to help the trees establish in our very sandy soil. This comes on every 2 days for half an hour and you may hear the tap running near the deck area. The green roofs also have irrigation to help them establish. The garden has been designed to minimize the use of water and we hope that once fully established we wont need to use additional water at all.